Functions for performing the Bayesian bootstrap as introduced by Rubin (1981) and for summarizing the result. The implementation can handle both summary statistics that works on a weighted version of the data and summary statistics that works on a resampled data set. The bayesboot package implements a function bayesboot that performs the Bayesian bootstrap introduced by Rubin (1981). The implementation can both handle summary statistics that works on a weighted version of the data or that works on a resampled data set. If we want to compare the means of two groups, we will have to call bayesboot twice with each dataset and then use the resulting samples to calculate the posterior difference. For example, let's say we have the heights of the opponents that lost to the presidents in height the first time those presidents were elected. Now we are interested in comparing the mean height of American presidents with the mean height of presidential candidates that lost. # The heights of oponents of American presidents (first time they were elected). 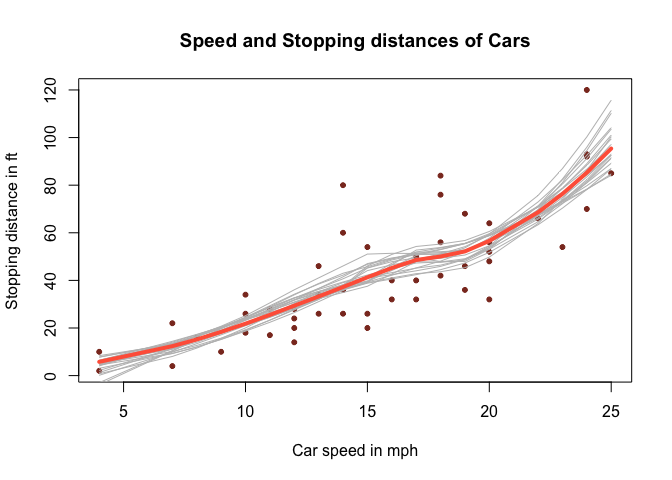 # Plotting a scatter of Bootstrapped LOESS lines to represent the uncertainty. For more information on the Bayesian bootstrap see Rubin's (1981) original paper and my blog post The Non-parametric Bootstrap as a Bayesian Model. 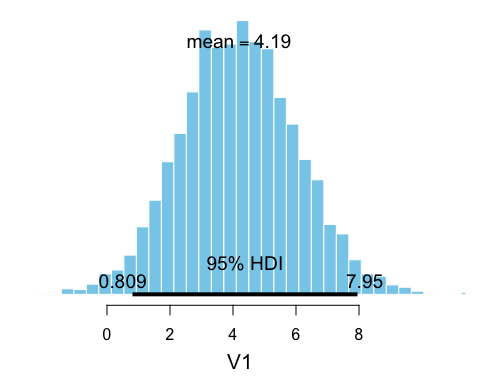 The implementation of bayesboot is similar to the function outlined in the blog post Easy Bayesian Bootstrap in R, but the interface is slightly different. Fixed issue with unstated dependencies in the tests. Modified the tests so that they are compatible with upcoming version of the testthat package. bayesboot now warns when the posterior sample contains NAs, NaNs and NULLs. plot.bayesboot now correctly resets graph parameters. 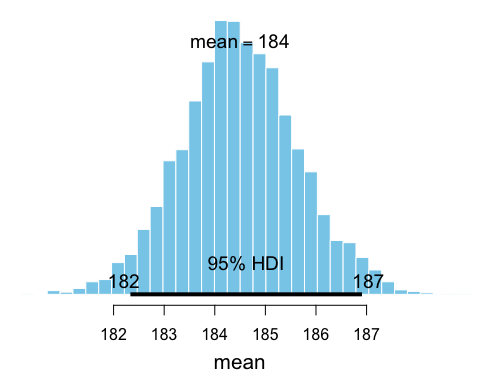 Removed bayesboot::hdi and instead depend on HDInterval::hdi .